On Tuesday, the much awaited dialogue took place between Taliban representatives and political figures of Afghanistan who possess no government role. Former vice president Mohammad Yunus Qanooni explained to the delegates that the system in Afghanistan was established based on the “will of the Afghan people” while he defended the Constitution and called it as “one of the best in the region”. He thus added that if any changes are required, amendments to the Constitution can be done through legal channels. Qanooni also said that the present Islamic Republic system is at the request and will of all Afghans, having been founded on vast amount of sacrifices by millions of Afghans. Therefore, emphasising on the solid nature of the existing system in the country like an army, a judicial system & a parliament, he said that all of it is worth defending. Addressing Moscow the talks, Mohammad Mohaqiq, who is a vice presidential candidate told the Taliban to show some “flexibility” in holding face-to-face direct talks with Afghan government representatives. “We should work on ceasefire and government should also join these peace talks”, he said and also added that there is no legal and religious justification for the long-drawn war in the country. Former president Hamid Karzai, who was one of the participants, began by pointing out the sheer number of graves in Afghanistan and how everyone, including the Taliban are tired of this war. Karzai emphasised how a democratic and free Afghanistan is achievable, given that there be unity among the people. While welcoming the efforts of the United States in the peace process, he expressed his hopes about Pakistan and Afghanistan cementing good relations. Karzai expressed that he believes the Moscow talks will end on a positive note. 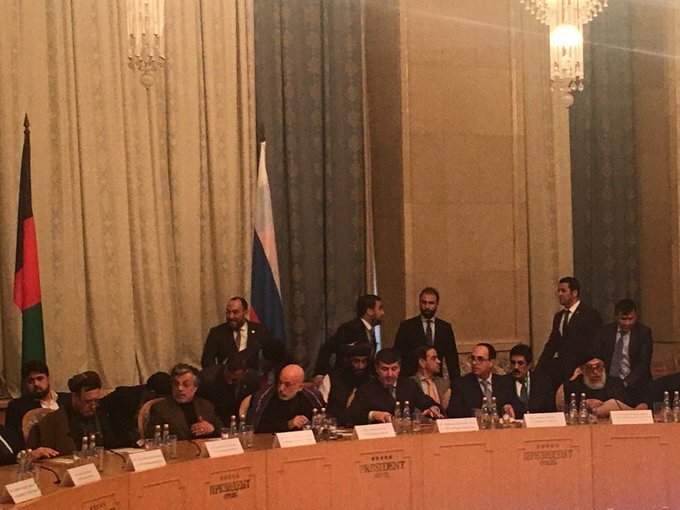 Taliban member and leader of the group’s delegation to Moscow, Abbas Stanakzai, began his opening address by stating how the group has been fighting a “holy war against the US” and their allies for almost twenty years. But having focused on the military aspect, he admitted that the Taliban also believes in a political solution to the problem. Stanakzai told the delegates that after pullout of the US Forces from Afghan territory, the Taliban will not demand any political monopoly. But he put up a condition in this process by saying that in order to achieve sustainable peace, the names of Taliban leaders must be struck out from the US blacklist. Women’s rights and empowerment issue is one of chief concerns of the international community, activists and women of Afghan when it comes to Taliban, but in the talks today there was certain degree of convergence between the two sides. In this regard, Stanekzai assured that Taliban have a clear policy about women rights and adhere to the principle of “giving” them the rights they deserve. Perhaps the issue lies in the idea of Taliban leader who believe it is up to their discretion, whether or not to give a part of the population a set of basic, Humanitarian rights. Stanekzai also clarified that the Taliban has never targeted girls schools or poisoned female students, nor has the group ever targeted civilian vehicles using IEDs. However, there was a major point of divergence as well-the constitution. Taliban representative Stanekzai upheld his group’s view that the Afghan Constitution is “illegitimate” and “imposed on Afghans by Kabul’s administration”, proving to be a “barrier in the road to peace”. The Taliban leader said that the group certainly wants the crisis to be resolved in a peaceful way emphasised on its significant role in the security of the region. He said “Afghans need humanitarian aid and Taliban will work towards that and talk about it with the international community and the United Nations”. Afghan politician, Ata Mohammad Noor on the other hand, called for an interim government at the dialogue. He said “If peace efforts produce results, it is worth that presidential election be postponed”. Noor explained that the interim government is conducive to the presence of political currents as it would maintain the current framework which in turn would lead to dignified integration of Taliban.